THE Moresby Arts Theatre is proud to present their latest production this season called ‘Murder at Moresby Manor’ – a laugh-a-minute murder mystery play which opened on Thursday for two weeks only. The play introduces a fictional version of a ‘Moresby Arts Theatre’ cast who are bravely working to stage a classic ‘whodunit’ in the style of a 1920s English murder mystery. But these amateur actors, while they may have the best intentions, stage a production that probably doesn’t go exactly as the original playwright envisioned. The accident-prone thespians bumble about on stage and battle on against all the odds to make it to the final curtain call. The Murder at Moresby Manor is a highly physical comedy packed with farce and slapstick, delivered with split-second timing and features a set that holds many secrets for the audience to discover. The meta play (a ‘show-within-a-show’) features an exceptionally talented mix of local PNG and expat actors, including EMTV’s Vocal Fusion host and past winner Jacob Ilave, Godfree Kaptigau, who stared in 2016 PNG’s feature motion picture “Lukim Yu”, and Tidman Ikosi, who has been in countless stage and screen productions (“Mr Pip”, 2012). Murder at Moresby Manor is directed by Natalie Pidik, produced by Kevin deBruyn, and the Production Manager is Tidman Ikosi. The creative team is no stranger to bringing great entertainment to the stage in Port Moresby, having last been a part of presenting 2012’s ‘Rock of Ages’, ‘We Will Rock You’ in 2011, and ‘Wicked’ in 2010. 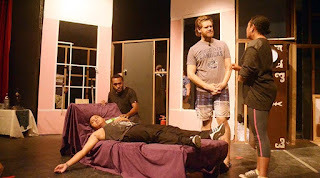 After a few years’ hiatus, the team of Pidik, deBruyn and Ikosi is excited to bring this comedy to PNG audiences. “The past number of shows we have been a part of producing have been musicals, and so bringing a comedy to life has been a very difficult and different task. There are no notes to sing or dance moves to learn, but that does not mean that there is no choreography to learn. The Murder at Moresby Manor has been without a doubt the most challenging show we have worked on, but with all that effort comes a show we are the proudest to present, and we are confident that this show will leave the audience entertained,” says Mrs Pidik. Mr Ikosi explains why it is so important to him to pour the hours into designing the production. “Most people think that joining the Moresby Arts Theatre means you have to get on stage and start performing. For those who are extroverts, that is a breeze for them. Introverts, on the other hand, will find that confronting,” he said. “A stage production is more than just the actors on stage – lighting and sound, back stage management, and set design and building are all part of the big picture. The Murder at Moresby Manor audience will share in the agony of our well-meaning cast for themselves, and our bunch of ‘would be’ thespians will guarantee you leave aching with laughter. Murder at Moresby Manor is presented live at the Moresby Arts Theatre from Thursday 31st August to Saturday, 2nd September and from Thursday 7th September to Saturday 9th September at 7:00pm, with an additional matinee on Saturday 9th September at 1:00pm. Adult seats are K50, students (18 and under) are K20, and Matinee all seats are K20. Tickets are available at Boroko Foodworld, Waterfront Foodworld, the MAT Office Monday – Friday 9am to 4pm, or sold at the Theatre at the door for each performance. The family-friendly show is appropriate for all ages, and runs for around 2 hours and 15 minutes, with security provided at the MAT. Refreshments are available from 6:00pm before the curtain raises each night, so come along and enjoy the best of live theatre right here in Port Moresby. Murder at Moresby Manor is presented live at the Moresby Arts Theatre from Thursday 31st August to Saturday, 2nd September and from Thursday 7th September to Saturday 9th September at 7:00pm, with an additional matinee on Saturday 9th September at 1:00pm. Adult seats are K50, students (18 and under) are K20, and Matinee all seats are K20. Tickets: Goroko Food World, Waterfront Foodworld, MAT.